Have a gardening question? Want to know about the latest events? Need to bring a sample for identification? Contact us by phone, online, or in person. 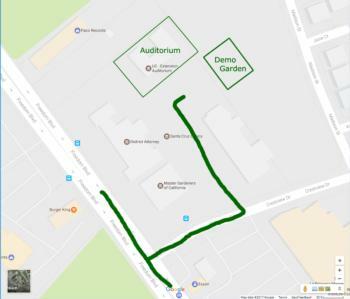 You can find the Master Gardener Office, Auditorium and Demonstration Garden towards the back of the complex by turning off Freedom Blvd onto Crestview Drive then take a left into the parking lot. This year the we're sharing the parking lot with two large portable buildings due to construction. The garden is BEHIND THE PORTABLE BUILDINGS! Sign up to subscribe to our gardening newsletter and be informed about classes and events. Know about something happening in the area other home garderners might be interested in? Let us know so we can share it.